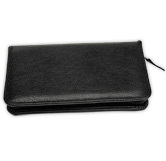 A classy look for your checkbook is what you'll get when you choose this elaborate monogram featuring the letter 'V'. It's an eye-catching way to add some extra personalization to your personal finances. The beige background is reminiscent of aged parchment and the elaborate scrolls surrounding the symbol give this design an elegant appearance. But looks aren't everything. 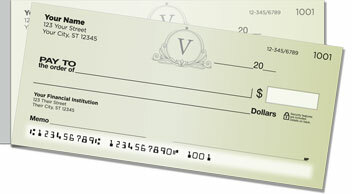 The big benefit of this product is that you'll have fewer embarassing moments in which you accidentally rip a check. That's because a shorter side perforation makes it easier to pull checks from the pad. Get your very own V Monogram Side Tear Checks right now! Order them with matching return address labels.